Bvlgari Aqva Pour Homme Marine suitable for even the hottest days. 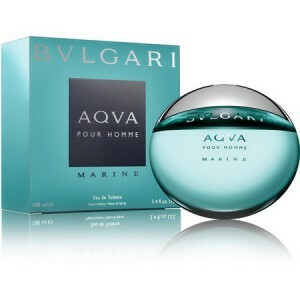 Bvlgari Aqva Pour Homme Marine 100ml. EDT by Bvlgari Eau de Toilette for men. Launched in 2008. Aqva Pour Homme Marine is classified as an aquatic, flowery, masculine fragrance. Fragrance notes: neroli, rosemary flower, white cedarwood. Bvlgari Aqva Marine Pour Homme is a fresh fragrance with fruity and spicy notes which is inspired by the power of energizing water and hypnotizing sound of the waves. Aqva Pour Homme Marine is like a nectar of fruit and spices that are hidden in a bottle with a unique design that resembles a crystal blue. A fragrance suitable for even the hottest days because it has a refreshing effect. Fresh notes of grapefruit and lime adds a touch oriental fragrance, unforgettable is followed by full flavors of rosemary and calendula masculinity. Essences of amber and cedar offers sensual fragrance, feeling that will linger for a long time. Overall, the fragrance offers a refreshing and relaxing experience. Luxury brand Bvlgari jewelry created especially know has made a name in the perfume industry for quality products. Bvlgari perfumes is distinguished by unique flavors, and the creativity bottles whose design is shaped by unique personality of each flavor. Bvlgari perfumes are made on any person tastes, from fresh essences fans, to those who love a strong scent and elegant. Let yourself be impressed by the energy and power Aqva Marine Pour Homme fragrance and enjoy an unforgettable experience that only give, this perfume.